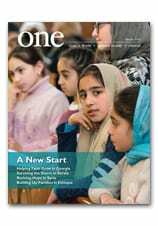 As the situation in Syria continues to deteriorate, and pleas for peace are heard again and again, we were reminded of a story in our magazine from 2014: a Letter from Syria by the Rev. Ziad Hilal., S.J. Of course, one gets scared considering all the deaths and violence that are directly affecting this life, but our solid belief helps us defeat this fear, knowing that God is with us no matter what. Our Lord and Savior Jesus Christ teaches us: “Peace I leave with you; my peace I give you. I do not give to you as the world gives. Do not let your hearts be troubled and do not be afraid” (Jn 14:27). Hope is always stronger than fear. For this Friday’s video, we offer this profile of Father Ziad that accompanied his letter. Pray for the Syrian people and all those, like Father Ziad, who are seeking to help them. Earlier this week, a visitor from Iraq stopped by our New York offices: the Rev. Thabet Habeb Yousef, a 42-year-old Chaldean Catholic priest from the town of Karemlesch in the Diocese of Mosul. Father Thabet serves as the sole parish priest at St. Adday Church in the town. With the arrival of ISIS in 2014, hundreds of Christians fled, settling in Erbil, in Iraqi Kurdistan. They have only recently begun to return home. What they found has been heartbreaking. But slowly, he said, the people have begun to reconstruct the town, thanks to the generosity of various church charities. And he has worked, as well, to restore a sense of purpose and hope. While he is in the United States — he will be visiting family in Detroit for a few day before returning to Mosul — he says he gets regular emails from his flock. Much support, he said, comes from the faith of the people, and understanding their purpose in that part of the world. Christians have deep roots in the region, he said, going back to the first century. And his message to his flock? For a powerful look at what some displaced Iraqis are facing when they return home, watch the video below by Raed Rafei.